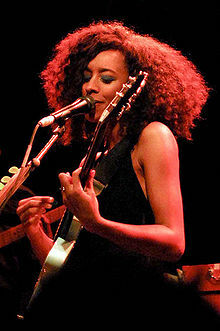 Today im going to blog about this impressive album from Corinne Bailey Rae titled The Sea. Im sure that not many people know about this girl unless its Taylor Swift. DUH! Year Grammy and Best Contemporary Jazz Album for her work as a featured artist in Herbie Hancock's River: The Joni Letters. Bailey Rae was married to fellow musician Jason Rae from 2001 until his death in 2008. Bailey Rae released her second album, The Sea on 26 January 2010, after a hiatus of nearly two years. Tracks on the new album have been produced by Steve Brown and also Steve Chrisanthou (who produced her debut album in 2006). She has sold 4 million albums, with her two albums combined, worldwide. Bailey Rae was nominated for the 2010 Mercury Prize for Album of the Year for The Sea. The album is really tight. Wonderful songs every here and there. I think everyone should have this on their Ipod instead of Fall Out Boy. LMFAO!